Dave Riggs holds the golf ball he hit 310 yards to make a double eagle, hole-in-one, on the 15th hole on the NSU Demon Hill Golf Course Friday, where he is a senior member. Judge Fred Gahagan, left, and John Vandersypen were members of the five-some and attested to the rare feat. 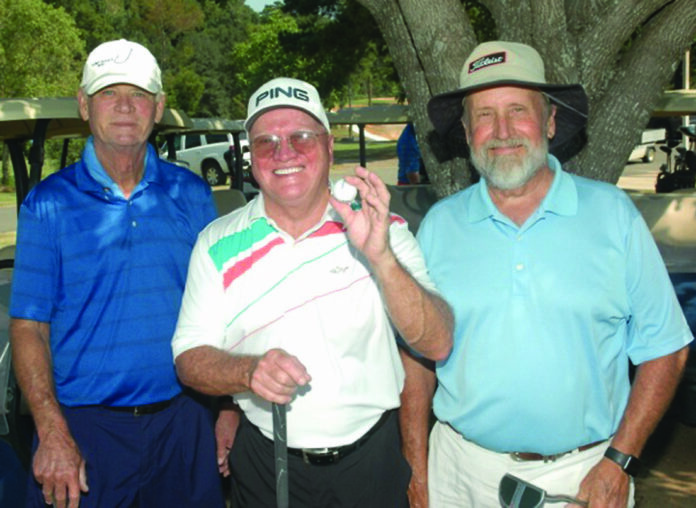 Other members of the group were Nate Briscoe and G. F. Thomas Jr. Riggs said this was his fifth double-eagle. He has had a hole-in-one on one par three and three double eagles on par fives. This was his first hole-in-one on a par four hole. A double eagle is a score of three strokes under par on a single hole.